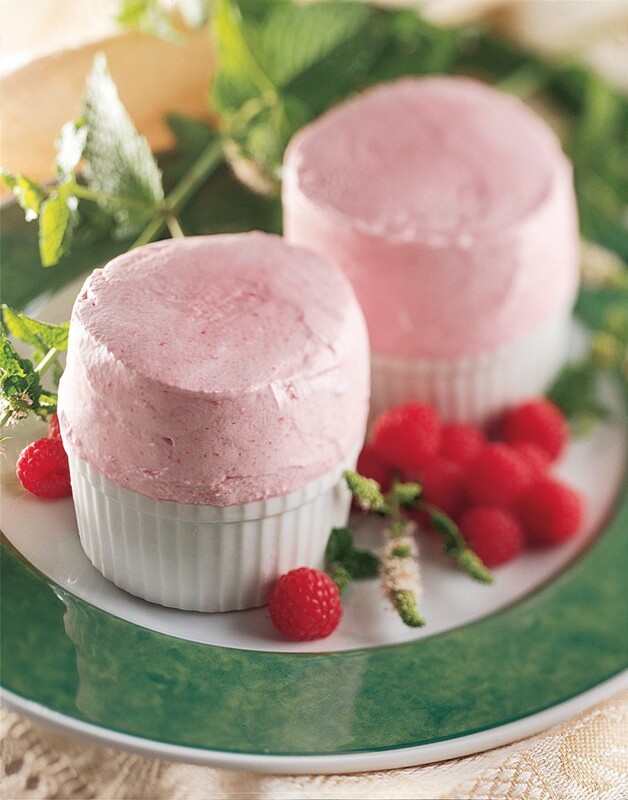 Frozen soufflés are a perfect make-ahead warm weather dessert. 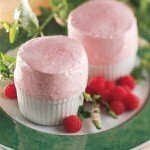 The raspberry fruit brandy adds a deeper, more concentrated raspberry flavor to the soufflé. Parchment paper is used to extend the sides and act as a collar. Your guest is bound to be pleased by the rich cool taste. Clean and remove any stems from the raspberries. Reserve 20 nice berries for later use. Purée the raspberries in a food processor and strain to remove the seeds. Approximately 2/3 cup of purée should remain. Break the egg into a glass or stainless steel bowl or double boiler. Add the honey and whisk thoroughly. Place the bowl over a pan of hot, simmering water or double boiler. Beat continuously, using the whisk to scrape the egg from the sides and bottom of the bowl. Cook for approximately 1 minute or until the egg thickens slightly. Add the raspberry brandy to the purée and stir into the egg and honey mixture. Set the bowl aside. Whip the heavy cream and fold into the egg and raspberry mixture. Stir in all but 2 of the reserved whole raspberries. Refrigerate. To assemble the soufflés: Butter the strips of parchment paper. Form a collar around each mold, buttered side in, and secure with tape. Fill the mold to the top of the collar with the mixture and freeze for at least 6 hours or overnight. To serve: Remove the collar and top the souflées with the reserved raspberries. Allow to stand at room temperature for about 15 minutes before serving.